A grand summer house where memories are made. 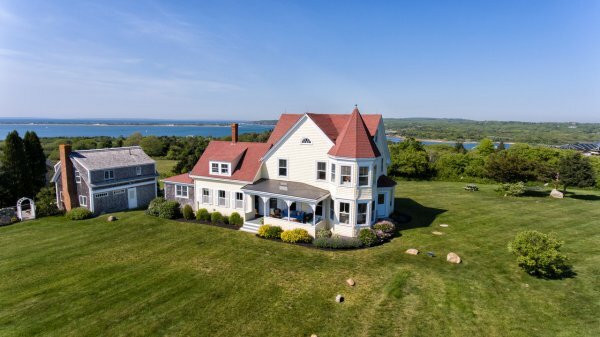 This landmark Victorian commands magnificent hilltop views down over sloping fields to the Atlantic Ocean, Quitsa Pond, Menemsha Pond, Vineyard Sound and the Elizabeth Islands beyond. Light-filled and beautifully furnished and decorated, the house boasts a large eat-in kitchen, 3 renovated bathrooms, a gorgeous masterbedroom with sunrise exposure. The first floor bedroom has an ensuite bathroom. Almost every bedroom has views of wonderful Menemsha Pond and even Squibnocket from the Tower Room. Tower House offers access to excellent private beaches: Menemsha Pond below the house, Squibnocket in walking distance, and famous Lucy Vincent Beach, and also the incredible private Hancock Beach. A great home for a family gathering, a group of friends, or if you are planning of a spectacular special day or wedding at this incredibly beautiful location.